Male Megalopsalis, probably M. eremiotis, photographed in Victoria by Kennedy H.
Taylor, C. K. 2011. Revision of the genus Megalopsalis (Arachnida: Opiliones: Phalangioidea) in Australia and New Zealand and implications for phalangioid classification. Zootaxa 2773: 1-65. A morphological phylogenetic analysis is conducted of Australasian harvestmen previously included in the family Monoscutidae. Monophyly of Monoscutidae is not supported, and the subfamilies Monoscutinae and Megalopsalidinae are synonymised with the South American subfamily Enantiobuninae. Monoscutidae is re-synonymised with the family Neopilionidae. The analysis also demonstrates the polyphyly of species previously assigned to the genus Megalopsalis. Megalopsalis epizephyros new species, M. eremiotis new species, M. leptekes new species and M. pilliga new species are described and M. serritarsus and M. hoggi are redescribed, all from Australia. Hypomegalopsalis tanisphyros new genus and species is described from Western Australia. Megalopsalis linnaei is transferred to Tercentenarium new genus. Forsteropsalis new genus is established to include species from New Zealand (including Auckland Island): Macropsalis chiltoni (type species), Pantopsalis distincta, Macropsalis fabulosa, Pantopsalis grayi, Megalopsalis grimmetti, Megalopsalis inconstans, Megalopsalis marplesi, Megalopsalis nigra and Pantopsalis wattsi. One of the quirks of my PhD thesis was that, by the time I'd finished, it seemed that the family of harvestmen I'd chosen to work on didn't actually exist. My reasons for coming to that conclusion are presented in a paper published today. The paper has two major components: one is a taxonomic revision of the genus Megalopsalis, the other is a phylogenetic analysis of what had been the family Monoscutidae. Because phylogenetic analyses of long-legged harvestmen are few and far between (in fact, I'm only aware of one earlier morphology-based numerical analysis), analysing the phylogeny of Monoscutidae required me to also analyse exemplars from other families of long-legged harvestmen, just to make sure that the Monoscutidae could be supported as monophyletic. Which it couldn't. When the results of the analysis came back to me, I saw that they had nested the South American Thrasychirus well within the Monoscutidae (everything from Spinicrus nigricans downwards in the tree above, reproduced from the paper, which is a consensus of a number of analyses done under varying parameters). Thrasychirus has not been previously regarded as a monoscutid, though Hunt & Cokendolpher (1991) had suggested that a relationship between the two was not outside the realms of possibility. Instead, Thrasychirus has been placed in the Enantiobuninae, treated as a subfamily of the family Neopilionidae. As well as the Enantiobuninae, Neopilionidae includes Neopilio australis, a species without close relatives from South Africa, and Ballarrinae, a group of tiny harvestmen with extraordinarily long palps found in Australia, South Africa and South America. Male Forsteropsalis, probably F. inconstans, photographed by Alan Macdougall. For a few reasons, I'm a little skeptical of the exact position of Thrasychirus in the above tree. The relationships between taxa were not strongly supported, and a couple of features of Thrasychirus look as if they may be consistent with a more basal position. 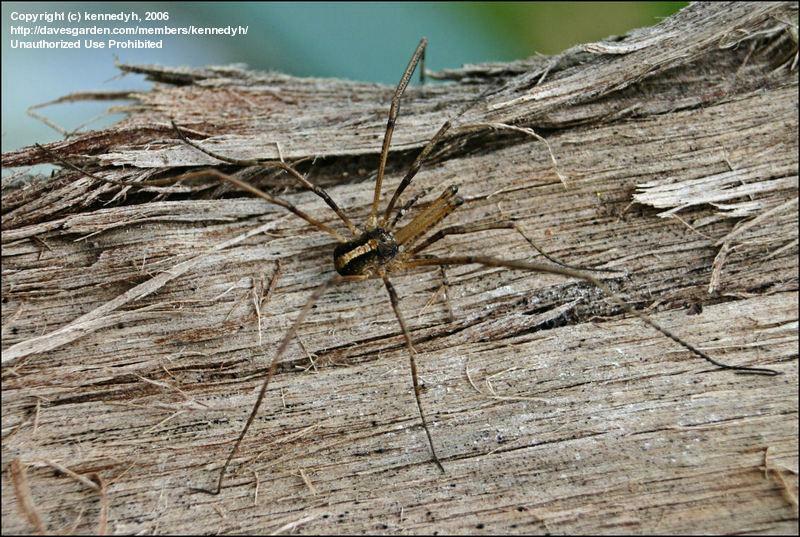 Most notably, in most families of long-legged harvestmen the tarsus of each leg is divided into a basitarsus and distitarsus, with a distinct hinge allowing easy bending at the junction between the two. In most 'Monoscutidae', this hinge has disappeared and the junction between the two parts of the tarsus is fixed in a straight line. However, Thrasychirus (as well as Australiscutum, which I talked about in an earlier post) has a mobile hinge. However, whatever the exact position of Thrasychirus may turn out to be, I feel reasonably confident that the combination of 'Monocutidae' and Enantiobuninae will continue to be supported—in particular, the two share a unique spiracle morphology that has not been recorded from other families—and so I chose to recognise this clade as a single taxon. Enantiobuninae happens to be an older name than Monoscutidae, so it that was the name I had to use. In most analyses, this expanded Enantiobuninae was nested within a clade also including the other Neopilionidae*, so I chose to continue to treat Enantiobuninae as a subfamily of Neopilionidae. *The exception was the analysis conducted with all characters given equal weighting, which gave some somewhat suspicious results (it failed to recover monophyly for some taxa that have been universally accepted in the past). 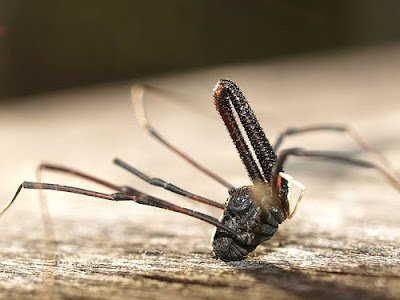 It is my suspicion that these odd results were mainly due to the single included example of Ballarrinae; ballarrines have some features convergent with the Dyspnoi, another group of harvestmen, and these characters tended to pull the ballarrine towards the Dyspnoi. I have a manuscript currently in preparation that indicates that these unexpected results disappear as more taxa are included in the analysis. The holotype of Hypomegalopsalis tanisphyros. Most other results in the paper are reasonably straightforward. The genus Megalopsalis as recognised to date appears to be polyphyletic; in particular, the New Zealand species previously included in that genus have been moved to a new genus, Forsteropsalis, and are probably more closely related to other New Zealand enantiobunines in the genus Pantopsalis. The Western Australian Megalopsalis linnaei, a definite oddball among the Enantiobuninae, also gets its own genus Tercentenarium. And another new Western Australian species gets its own new genus in Hypomegalopsalis tanisphyros. Let me be up front and say that I do not regard the establishment of Hypomegalopsalis as one of my greatest achievements. One of the failings of the binomial system of nomenclature, in my opinion, is that it doesn't really allow for uncertainty. Including a new species in a pre-existing genus effectively makes a statement that that species is more closely related to the members of that genus than any other. On the other hand, many taxonomists would see the erection of a new genus as a statement that its member(s) are significantly different from those of pre-existing genera. In the case of tanisphyros, my initial expectation was that it would turn out to be a small species of Megalopsalis. However, none of the analyses I conducted supported such a clade. To include tanisphyros in Megalopsalis and keep the genus supported as monophyletic, I would have probably had to also include the heavily sclerotised species previously included in the 'Monoscutinae', which would have made the single genus Megalopsalis more morphologically disparate than probably the entire remaining Phalangioidea. If it was possible to describe a new species without placing it in a genus, I would have done so for tanisphyros, but the binomial system does not allow for such things. Placing it in a separate genus seemed the least objectionable option. Still, if anyone conducts a further study in the future that supports quashing Hypomegalopsalis, I won't be protesting. Hunt, G. S., & J. C. Cokendolpher. 1991. 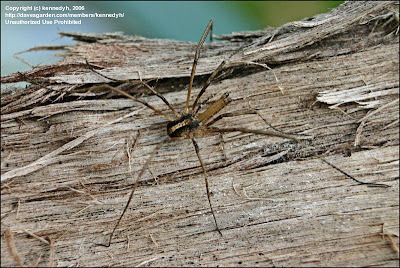 Ballarrinae, a new subfamily of harvestmen from the Southern Hemisphere. Records of the Australian Museum 43: 131–169. Based on that tree, why did you feel the need to create a new genus for tanisphyros, but not leptekes, which is also not definitely placed with Megalopsalis? Because leptekes did group with Megalopsalis under some parameters, so I used that as an excuse not to create a further new genus. However, both tanisphyros and leptekes are difficult to place phylogenetically, and I'm not really satisfied with the generic placement of either. On that note, I should point out that the scattered positions of 'Spinicrus' species on the tree is something that I'm dealing with in the manuscript that I'm currently working on. Congratulations, Christopher! A very substantial achievement. I do strongly agree that binomial nomenclature, often touted as one of Linnaeus's great innovations, is turning out again and again to be more curse than blessing: in short, it ties nomenclature to a specific phylogenetic hypothesis. I think the reason that so many Mesozoic dinosaur genera are monospecific is not so much that neither namers feel that "generic separation is warranted" but because the use of what are effectively uninomials leaves us free to shuffle the phylogeny as the data dictates without needing to change names every time we do so.